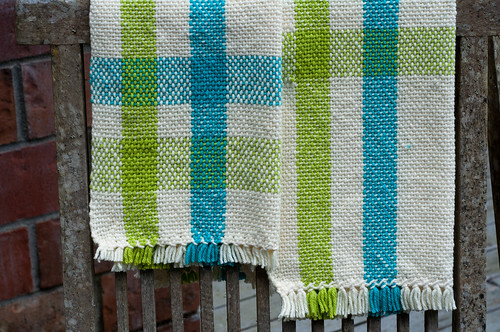 There’s a rigid heddle weaving class on Craftsy that I find very helpful. I watch bits and pieces of it periodically and pick up new tips and tricks that I slowly add to my process. One of the two projects in the class is for tea towels made in Sugar’n Cream cotton or some other worsted weight kitchen cotton. 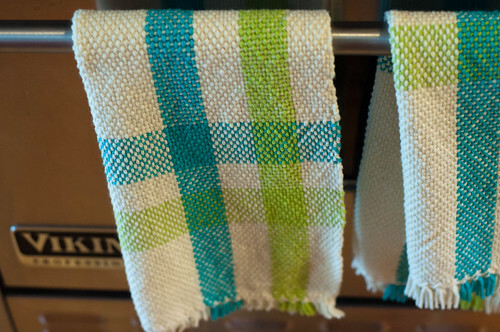 I decided I could always use more kitchen towels and made a set. Lily Sugar’n Cream cotton in soft ecru, mod blue, and hot green. 136 ends in an 8 dent heddle, 2.5yd warp. I got two towels out of it, the same size as our store-bought towels (just thicker). I hemstitched both ends and then cut the fringe fairly short. I did not knot it, which may be a problem later on as these are washed frequently. I’m not too concerned. They were a very quick weave, about a week total. They didn’t shrink as much as I expected. Weaving with cotton for the first time and weaving almost the entire width of my 19″ rigid heddle loom created some tension problems. I had some warp threads at the left edge become loose. 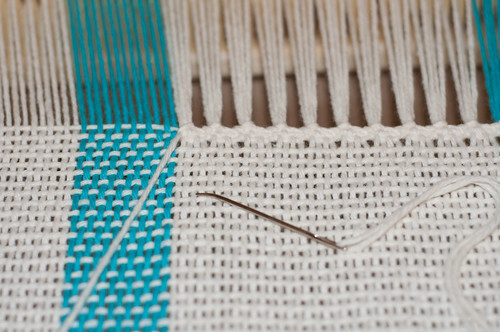 I added some weight to them while weaving to help — I think it did. We’re using the towels now. Handy! I love your towels – and especially the colorful stripes! I’m just learning how to weave, too. It seems like it’s popping up everywhere. Good luck with washing them. I’ll keep my fingers crossed.